Our work is driven by dedication to artists and making artists visible. 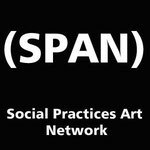 Social Practices Art Network (SPAN) is a media resource for individuals, organizations, community groups and institutions that are interested in new genre arts forms and practices. It is meant to serve as a platform for a variety of socially engaged art and design practices. We are happy to share news about our colleagues Jacqueline Bell and Jules Rochielle.